With this iExpression you can create a time string and animate it over time. The date can be formatted freely and additional text can be added before and after the time itself. 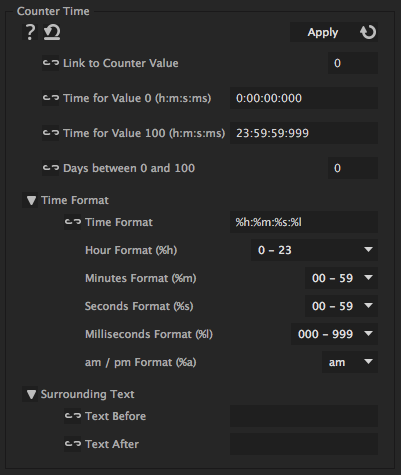 Simply link "Link to Counter Value" to a slider control and keyframe it to values between 0 and 100. Then you specify which time correpsonds to the value 0 and which one to 100. The iExpression figures out the time for all other values accordingly. allows that the start and end time are not on the same day. The counter then does not directly count from the start to the end time, but completes several 24 hours loops before arriving at the end time. determines, how exactly the time should look like. When the time string is created, this text is taken and symbols %h, %m, %s and %l are replaced by hours, minutes, seconds and milliseconds of the time, respecively. Additionaly %a is available to show am or pm. You can arrange the symbols freely (and also leave some out if you want, for example, no milliseconds). Inbetween the symbols you can add arbitrary other text.